If your website is not optimized, It is like you are doing business in a place where people don't go to. Nobody can see your business for people to know what services you offer or products you sell. How search engine optimization works is a campaign progression. It does not happen overnight. We have to keep going with the optimization of your websites for the ranking to consistently advance. Search Engines do not publish or release any information on how exactly you can rank on their search pages. Their algorithm is a closely guarded secret just like Colonel Sanders secret herbs and spices. Nobody else knows. Only the exact people who created them. Google have guidelines that tell you what they don't like you to do. And that's about it. But here at Guava Digi. We have more than 8 years experience in ranking websites. We know what it takes to get your company to be found on the search result pages of Google. What is (SEO) Search Engine Optimisation? SEO is something that is becoming more and more popular in the business world around us, and as the future continues to shoot forward into the digital age, it's assumed that it will continue to grow and grow. Already one of the main technique that you can use to help you out and get your name and brand out there, SEO is something that you need to learn about and understand from the beginning to experiencing it in order to appreciate it and see what it offers. Firstly, SEO stands for Search Engine Optimization, and it is used to determine the visible ranking of a website that you have within search engines such as Google, Bing and Yahoo, amongst others. Here's what you should know about it. Technically speaking, SEO first started coming around as far back as the middle of the 1990s, thought the internet was still growing into something that people understood how to use. Those who were in charge of creating the search engines – very primitive in those days – simply had to use the URL link and connect it to the search engine, created what we know today as a backlink (a link from a search engine to the content). Those who were using websites quickly realized that using SEO would help them get their content to show up first for those who were surfing the web and looking for ways to help themselves out. HTML, the language of search engines and websites, followed along a little later and made the world of SEO a little more refined. Even in these early days, it was always being understood just how powerful SEO could be in helping both search engines grow in popularity, as well as the companies that used them to their advantage. As the years passed, search engines began to develop a way to rank the different links in terms of how authoritative they were. This is what made SEO really take off, and it developed the world of backlinks immensely. By 2005, this process was working well and companies were responding well to it, creating a strong online presence by building up their authority online. As you can imagine, SEO can also be taken advantage of by those who are simply doing whatever they can to create links and index themselves higher on Google and other search engines. In 2011, a google algorithm filter called the “Panda update” was finally introduced that would penalize companies that were found to be low quality websites or thin sites. Panda specifically targeted content farms. These websites uses meaningless contents called badly spun articles. This helped battle this problem a that time, and during the years, released Penguin updates, different versions of penguin and panda and kept releasing updates after another. SEO, when used correctly and in following all the rules of the search engine, is very effective in creating the right results. It will allow the company to rank itself higher on the search results in terms of the keywords that they want to rank for. The more popular the keywords that you want to target, the more the competition you are going to get. But once you are on first page of the results. The greater benefit it will be for your company. This is made even better by combining SEO with a PPC option (pay per click). It allows for companies to advertise their brand by having their website link shown at the top of the page in a search engine when those same keywords are typed in. It is a service that the company pays the search engine for, and can be very effective. The only main issue with this kind of marketing, however, is that there is a lot of turnover for these kinds of advertisement gigs, so it may not always be the best method for long term use. Traditional SEO methods are important to keep up and use effectively. Most importantly, however, is that in marketing, showing on first page results are not everything. It's important to have as many good backlinks as possible to get your company's name and reputation up, but the website content – has to be well written, otherwise potential customers will be turned off by the poor quality once they click on the link. As you can imagine, with something this sophisticated, people have found a way to corrupt the entire process. This is where we must learn about both whitehat and blackhat SEO techniques. Whitehat techniques involve the methods that we've already talked about: writing quality content and also creating quality contents from other reputable websites and ads, etc that promotes your main site. It takes longer to build up a reputation this way online, but it also is less risky, and the search engines like it. Blackhat SEO, on the other hand, is when you break the rules of the search engine in order to increase your rank quickly. This will get your website penalized or de-indexed, sometimes permanently, once google find out about it. A few examples of blackhat SEO techniques that easily breaks google guidelines are Cloaking, Doorway Pages, Keyword Stuffing, Article Spinning, Blog Comments Spam, Use of Software to acquire spammy backlinks and a lot of others. These are jargons, but in easier to understand language. Examples are duplicated content on different brand website (mooching off an already established brand), creating a link to one page of content, but then redirecting to a spam page once it's clicked on, creating hard to read text, etc. Lastly, SEO can be categorized into two main sections, both of which need to be taken seriously in order for the company to make the most out of their efforts in the long run. On-page SEO is understanding and carefully putting together on how your website is built. Making the necessary Search Engine acceptable layout of the page highlighted, which you also call SEO-friendly, and an example of these are by putting the right meta tags, html H1 on titles, placing a graphic or images strategically on the page and the over all website linking structure. Also making sure that you carefully incorporate your brand on your product or service so that it is well-received. Off-page SEO is how popular and linked your entire website is. Search engines at the moment still relies on other websites endorsements for a website to be technically popular in their eyes. So the more endorsement a website gets from other websites determines it's popularity. These is how major search engine's algorithm is thought to be working at the moment(remember it's a secret) Yes you will want to make sure that your entire website is up to snuff so that you aren't just creating one powerful page and forgetting about the rest of it. Having a good reputation in both of these is critical if you want to make the right positive impression on the world around you in terms of SEO and making the most out of it. 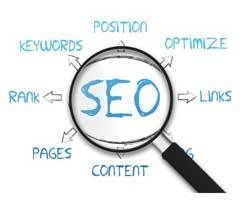 This is also seen as one of the strongest ways to market yourself via SEO in the world today.